This rare "Ant Plant" is an another interesting and unusual epiphyte. They are native to southeast Asia and belong to the family Rubiaceae (relatives of coffee and gardenias). 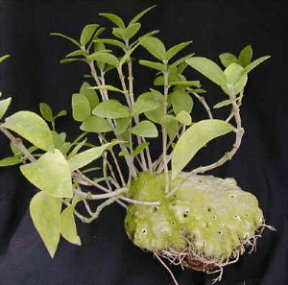 The plants have a smooth skinned swollen base that is riddled with caverns and tunnels that the ants use for their home. The plants take advantage of the ant's waste products while the ants are thought to help protect the plant from predators. They like high humidity, good drainage and bright light, therefore making them a great terrarium epiphyte when a sufficient light source is available. We have found that they do quite well when mounted onto background material. Available plants are young and have a caudex (swollen base) which is about an inch tall and as thick as a finger, growing in 3" deep pots. NOTE: Photo is of a different Hydnophytum species temporarily until we can find a better photo for now.